Last week, I decided that Bil and I needed to have more dates, more opportunities where he and I could spend time together having fun, instead of working or juggling the kids. So, we sat down and planned an in-home date, since both our favorite babysitters are out of town. Bil decided on an Italian night so we planned a fun menu and looked for an Italian movie on blockbuster.com. All week I was gearing up for this date. I was looking forward to spending quality time with my husband sharing the things we love: food, conversation, and movies. Bil made a loaf of French bread and I mixed together the ingredients for bruschetta and goat cheese and avocado crostini. Then, I made the cream puffs for our profiteroles, which are supposed to be filled with gelato, but I cheated and used Breyer's vanilla ice cream. The kids had played all day and neither had napped, which I actually thought would work in our favor: now they would both go to bed early. Everything was ready for the date, and then everything went terribly awry. Danny fell asleep at 5:00 without having eaten dinner. That was fine with me. I just hoped he would sleep through the night or at least through our date. Then, I got Charlotte ready for bed. She had a major meltdown; she was so exhausted from lack of nap that she couldn't calm down. When she finally did, Danny popped up out of bed ready for action. I fed him dinner and then decided to bribe him with a video. He could stay up and watch a video if he behaved and then promised to cooperate and go to bed afterwards. While Bil was getting the video ready for Danny, the phone rang. Bil's work was calling with some urgent question for him. While he was on the phone, I got Danny's video in the VCR, but it wouldn't work. Of course, Danny was totally set on that particular video even though we have hundreds of others. I finally convinced him to choose another one and that one won't work either. Obviously, the VCR (which is only about 6 months old) is malfunctioning. We go through what seems like hours of him begging for the video and me trying to convince him to pick a DVD instead; all the while Bil is still on the phone with work. Danny finally aquiesces and decides to watch Robin Hood which was much longer than I was hoping to let him stay up, but at that point I was desperate. Bil and I finally sit down to our delectable dinner and enjoy ourselves for maybe 10 minutes until we hear Charlotte wailing. Next ensues what feels like hours of Charlotte crying that inconsolable, over tired keening that goes right through me and makes me want to run far, far away. Meanwhile, Bil's work calls AGAIN. It doesn't end there, but suffice it to say that it takes quite a while for Charlotte to cry herself to sleep, and Danny puts up a minor fight about going to bed. Bil finally resolves the work issue and Danny gets put to bed. By this point, we are exhausted and it is only 9pm. We spend a good 15 frustrating minutes trying to locate the video that we had planned on watching, and I am getting irritable and snippy with Bil until he asks me, "Is this how we want to spend the little time we have left on our date?" By the time we sit down with our profiteroles in front of the video, I feel like we have lived through three frustrating days instead of just one evening. Next time, we will definitely be getting a babysitter and leaving the house! On the plus side, the food really did turn out quite well. I have kept a journal sporadically since I was eight years old. I have about 20 books filled with my ramblings that are alternately funny and embarrassing depending on what season in my life they represent. This weekend I have written some bitter diatribes about motherhood and wifedom, which was set off by my husband being gone for 4 days to chaperone youth conference, while I was left behind to referee fights with my kids, try unsuccessfully to potty train, and go crazy from boredom and loneliness (and to be honest, wallow in a healthy dose of self-pity). Which leads me to a question I have thought about a fair amount the last few months. Do I want people to read my journals after I have died? Don't worry, I am not losing sleep over this seemingly insignificant question, but it is one that has crossed my mind a few times. What got me thinking is my mom and aunt recently found an old journal of my grandmother's after she passed away 2 years ago, and everyone has different opinions about what to do with it. My mother thinks it is private and that no one should read it. My aunt disagrees, and so do I. I want to read that journal so bad that I practically drool at the thought of it. You see, my grandma was different than the quintessential doting granny from books and TV. She loved us, don't get me wrong, but she was very reserved and somewhat inaccessible emotionally. I don't feel like I really knew her. As an adult, I tried to get her to talk about herself more, but it was difficult. Now that she is gone, I regret that I didn't learn more about her as a person, her likes and dislikes, her dreams and happy memories. I think grandma felt like talking about those things would be frivolous and maybe uninteresting to other people. I wish I had conveyed to her my deep interest in getting to know her better. Maybe she would have opened up. So, of course, I would love to delve into that unread journal and learn more about her and what she thought about. I hope someday I get the chance to read it. But, I can see my mom's point, too. Did grandma want to keep her feelings a secret? Would reading her journal invade her privacy? I used to think that if someone wrote in a journal , they expected and maybe even wanted others to read it. But lately, as I write in my journal, I cringe when I think of my children reading my thoughts (especially those thoughts that shed a somewhat unflattering view of me). On the other hand, I so appreciate knowing about other people's struggles and their honest feelings. Knowing that I am not alone in my challenges, that others have dealt with negative emotions or doubts or fears typically makes me feel better. It makes me feel like those feelings are natural, that I too can overcome, that I am not alone. And it makes me feel closer to the person who shares those feelings with me. I think I will resist the urge to tear out the pages of this weekend's rantings. Who knows, maybe someday my granddaughter will read the entry and feel less inadequate as a mom or wife because she realizes that other women have felt the same way as she did. I can only hope. Last night, we were all outside playing in the beautiful 80 degree weather. Danny had gone to the backyard to play while Bil and Charlotte were playing catch in the front. Bil yelled for Danny to ask him if he wanted to play, and I hear Charlotte's little high-pitched voice saying, "Danny, haih bindou a?" which is "Danny, where are you?" in Cantonese. Totally shocked me that she had picked up a Cantonese phrase, which I use here and there in my daily speech. I know I am a nerd, but there are certain words that are so satisfying to say, that feel much more appropriate to particular situations, if that makes sense... And I suppose it is a small way to practice my Cantonese. The other evening before bedtime, Danny complained that he had hurt his leg. He asked for a Band-aid, but in the bedtime ritual chaos, I forgot. Later, Bil passed by Danny's room and Danny again requested the Band-aid. Bil, being a man, couldn't find the Band-aids, so in a burst of resourcefulness, decided to use a nasal strip instead. This satisfied Danny and made me laugh. This morning, Danny happened to notice the ugly mole on my forearm that sprouts impressively long hairs when I forget to trim them. I hate this mole but have learned to live with it. Apparently, it is the first time Danny noticed it and he was quite concerned. He kissed it and called it an "owie." Then, he started playing with (read: pulling) the hairs, at which point I squealed in pain. Finally, Danny told me he was going to get me a Band-aid and make it feel all better. Next thing I know I am wearing a nasal strip on my mole, which later pulled out all the hairs when I tore it off. Danny obviously has my temper. He not only gets frustrated with people (especially his parents and his sister) but the elements also anger him, most notably the wind. Whenever the wind blows too gustily, Danny lets it know of his displeasure and dissatisfaction. Yesterday as we were driving home from Wal-mart the wind struck again. I had Bil's car and since his car has no air conditioning, I had the windows wide open, which caused Danny to start scolding and accusing. Danny claims that the wind stole the pen he had been using to draw pictures, and he was quite upset about it. He spent the rest of the trip home railing against the wind's thievery of his pen. Go away! I want my pen back! You were naughty to steal my pen. Go in timeout right now!! You better give me my pen back! While I applaud Sesame Street for trying to be so responsible in helping to fight the rising rates of childhood obesity, I have some mixed feelings about this. I mean, do they (or anyone) think that a blue furry monster on a TV show is really to blame for kids eating too many cookies? For some reason, I am feeling irrationally protective of my second favorite Sesame Street character (I really have a soft spot for Mr. Snufleupagus). Couldn't they have found a better way to educate kids about nutrition? Where's the fun in a cookie monster who no longer sings the praises of cookies? I just feel a bit bummed out about this and I am not entirely sure why. I obviously do not want my children to suffer from obesity. In fact, as one who has battled weight issues for a large percentage of her life, I am really focusing on developing and helping my kids to maintain a healthy relationship to food. Charlotte happens to love the Cookie Monster (for some reason, he totally freaks out Danny), so maybe I should be grateful for this change. Still, I hardly think changing Cookie's Monster's whole schtick is necessary. What do you think? With childhood obesity's rates climbing as they are, there clearly needs to be some changes to be made. But what changes and in what arena? I think it needs to be a group effort among schools, parents, government officials, and the media, etc. if it is going to work. Maybe it is better to be safe than sorry. Who knows, maybe Charlotte will start saying "Cookies are a sometimes food" instead of "Me want cookies. Nom, nom, nom, nom, nom," though I somehow doubt it. I just finished an amazing book called Three Cups of Tea: One Man's Mission to Fight Terrorism and Build Nations. . . One School at a Time. The book chronicles the adventures and labors of Greg Mortenson, a former mountain climber turned humanitarian. In an attempt to summit K2 in Pakistan, one of the largest mountains in the world, Mortenson gets lost and almost dies. The people of Korphe, a small village at the base of the mountain help him and nurse him back to health. In return, Mortenson promises to return and help build a school for the village's children. If you couldn't guess by reading the title, Mortenson doesn't stop at one school, but makes it his mission to give as many opportunities for education to the children of Pakistan and Afghanistan, especially girls. The books details his work over the last decade, roadblocks, triumphs, failures, and it is amazing. What I found the most fascinating was how Mortenson explains why bringing education to the children in Central Asia is the best attack in the "war on terrorism." It is a really good book, very uplifting and inspiring and very well-written. Don't be deterred by all the names and places; I had a hard time keeping track at first, but it gets easier. 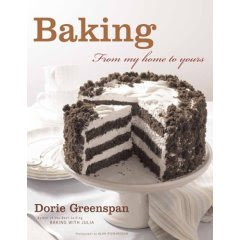 In my food blog exploration, I have discovered a very dangerous book... Dorie Greenspan's Baking: From My Home To Yours is amazing in its variety of baked goods. Not only are there cookies and several types of brownies and cakes, but it includes breakfast items such as sweet breads, muffins and even ice cream. The book is a dream and the pictures, oh, the pictures! Well, just look at the cover of the book and you will see what I mean. Who could refuse a cake like that? Bil has already requested that I make this cake for his birthday next month and I cannot wait. I am just dying for an excuse to dig in and start making recipes from this book. It is a good thing I only have it on loan from the library for a month, though I suspect I may be saving my money and buying my own copy. I love it! And I am not alone. Apparently, this book and author are really hot in the cooking world. They even have a food blog called "Tuesdays with Dorie" where members make a recipe from this cookbook every Tuesday and post the results. I briefly considered joining, but came to my senses. As much as I like baking, I can't see myself making a decadent treat every single week. Also, after perusing this book, you will see that many of these treats are somewhat time-consuming to make. It's just as well, since my waist-line and cholesterol levels would definitely suffer if I baked that often. One great thing about this book (besides the treats) is I have discovered that Danny loves baking. In fact, when he saw the book, he begged me at 9pm on a Saturday night to make a cake with him. Ever since then, he has been helping me make pancakes and begging to make cookies and cakes. The funny thing is that he really enjoys making the cakes a lot more than eating them. Partly, he enjoys measuring and helping, but he also really loves licking bowls and spoons and sneaking bites of batter (who doesn't?). It is fun to bake with him, but my freezer is slowly filling up with the results of our labors. Since I don't want to overindulge--and if there are baked good lying arounnd the house, I WILL overindulge--I have been stashing leftovers in our deep freeze. So if you ever want to come visit, I will have plenty of yummy homebaked goodness to offer you!